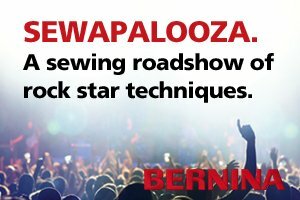 Experience the medley of the latest sewing, embroidery techniques, tips and technologies from BERNINA. If you sign up and pay by September 20th the admission price will be $39.00. ⦁ Maintenance kit worth $30 including a Micro Vacuum Attachment kit, and BERNINA needles. ⦁ And so much more! Preregistration is required and space is limited. Bring this card to register.